The heatwave this week turned us into boneless fur balls, languid and carefree. An army of mice could have galloped by and we wouldn’t have raised an whisker. The tiny nestling we rescued and brought to the wildlife rehabber sadly did not survive. On Tuesday, Gris Gris very gently brought in a fledgling that had fallen from a nest on the porch. He showed no desire to hurt it and looked incensed when I barked, “No!” I’m sure he was thinking Lady, I just wanted to show it to you, sheesh! I brought the bird to the wildlife rehabber who said, it needed another two weeks before it was ready to fly. Paws crossed for a better outcome. Odin managed some half-hearted hunting and preferred grassy weeds. Gris Gris is the designated garden snooperviser. Nothing escapes his attention. A hyper-vigilant scent-marker, he marks his favorite places daily, more than any other cat I’ve seen. It’s a way for a cat to feel more at home and insecure cats tend to do it more often. We like having breakfast on the porch and he’s a very elegant beggar, discretely vying for a bit of cheese or egg which is payment for doing his job: keeping a sharp eye on Merlin, who can be sniffing the bushes one minute and out of sight the next. Merlin blithely and blindly goes about his business secure that he’s taken care of. Odin is too independent to care about Merlin but Domino has turned into Merlin’s closest ally. The big “D’ is like a 300 lb. bodyguard who guides Merlin with body blocks and gentle nudges. In the image below, he’s checking to make sure Merlin gets inside okay. Home where it’s all okay. We think it’s the best place on Earth. Cat Adoption Month in winding down and there are millions of cats would would love nothing better than a place to call home. If the spirit moves you, search your zip code at Petfinder.com and see if there might be love at first sight kitty waiting for you. I’d like to thank each and every one of you who nominated us for a Pettie Award. I know many of you diligently and faithfully did it every day to which I say: You’re purrfectly awesome! We’ll know next week who the finalists are so keep your paws crossed for good news! Domino is such a cute dude!! Cats do make a house a home and wherever my cats are that is home. Great photos, your lucky to have such a beautiful place, or you’ve worked hard for it, don’t want to offend. I pinned them all. I voted for you, wanted to everyday, but we don’t have good reception and couldn’t get the screen. Wanted to be one of those faithful ones, but failed. I did tell the director of your blog and our mutual shelter, they have loads of people. If they vote for you and the shelter, hopefully you and Witty Kitties will win big! That’s nice green garden you guys have. The better to mark your scent I guess. Best of luck in Petties. Domino is obviously a carer! So sweet. I’ve finally given in and joined Pinterest, so I pinned Odin!! Thanks and we’re following you! Domino is such a loving brother…I tend to think animals have more empathy than humans! Your garden is the purrfect place to hang out! Your garden looks so wondrously lush, friends! Sorry to hear that the nestling did not survive. We are thankful that you tried, and have our paws crossed for the new one you found. I don’t have a garden but I sure do admire yours!!! It is such a treat to watch cats in a garden. Ours start the morning jaunt with over heightened vigor and energy, then they begin to wind down and sprawl into a content pile of fur, just watching the day go by without a care in the world. Lovely story and photos – it is especially heartwarming to see how Domino has taken to Merlin. 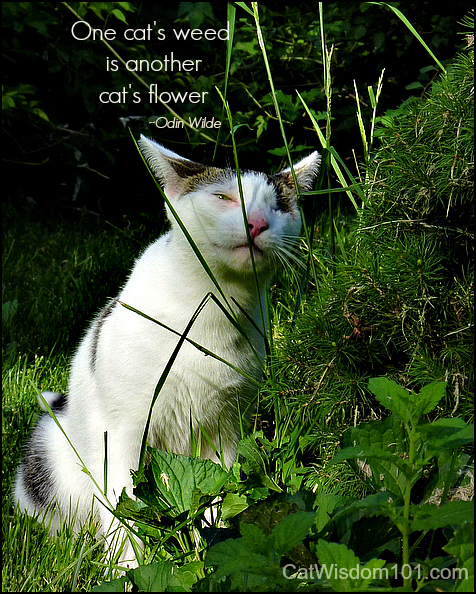 we love nothing more than cats in a garden. love the fledgling and Domino, Guide Cat, stories. What precious friends you have. Stay cool! Hi all, beautiful lush garden! We’ll try to send you some of our cool weather your way. Unfortunately, it comes with copious amounts of rain! Have a great weekend. It’s like a lovely little storybook, the boys are so happy. I love them all, but Domino is truly a magical creature. I’m sure he watches over all the boys, and you too. I miss my garden “scent-marker”, Stanley”, who kept all the evil spirits away, but Mimi’s face rubs are keeping things in line out there. I just love all these photos of your boyz and their relationships. Cats and green photograph so well together. 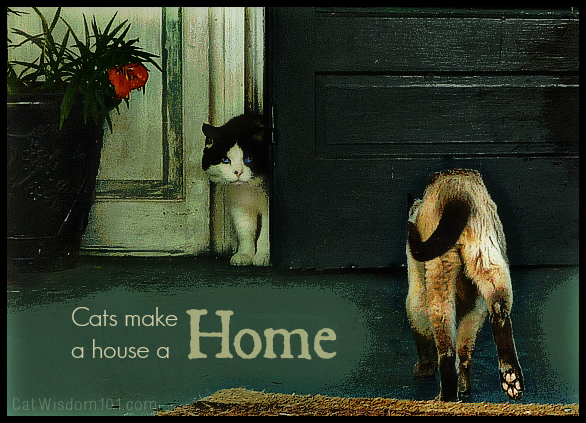 We love that “cats make a house a home” saying. It’s so true! We live in Florida where it’s really hot most of the year, but we stay inside in the air conditioning. We will think cool thoughts for you and everyone who is living in parts of the country that are unusually hot right now. 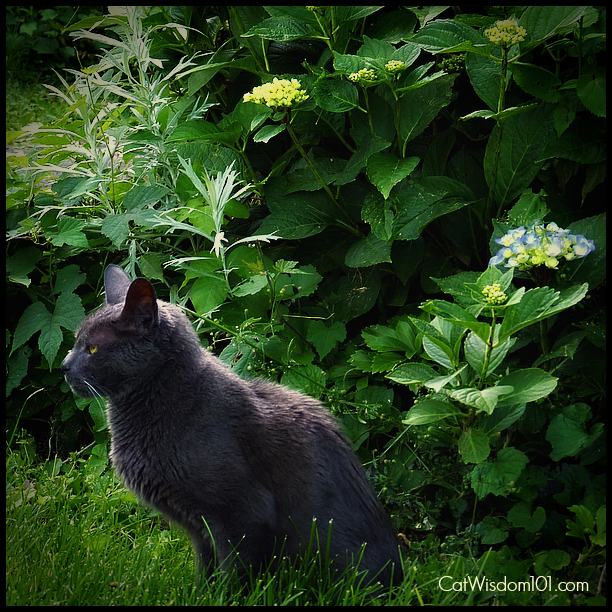 the shade-filled greenery in your yard is the purrfect place for your cats to languish! Impressive garden for kitties ! I really love it and the photos are PAWSOME !!! Awwwww!!! We loved your pictures!! Have a Happy Caturday!! We’re pretty lucky to be in the midwest. Our weather (though pretty hot) is nothing compared to the western heat and the eastern wet! Then again, it’s a constant 70 degrees here in the Townhouse. …but we do enjoy our windows!